“Once it was called something else. Then the letters a.t.t.a.i. were spat out of an old phone and they sat blinking on the table for a bit. Attai changed shape into a big rolled up ball made of graffiti, music, art, design, grit, moss and hair. The ball got sick of painting its name, so it started painting other things, with ideas inside. London based artist Attai is known for painting vibrant houses to bring some colour to the grey walls. “Trying to flip these houses on their heads and dodging the rain to finish this up before dark. “My piece from the Brockley Street Art Festival 2016, was based a round the idea of a tornado flipping the houses all over the place. Some Wizard of Oz undertones going on here. Bik Ismo is Puerto-Rican artist who specializes in realistic art. A great example of his work is this stunning piece for the Raw Project at the Jose De Diego Middle School. 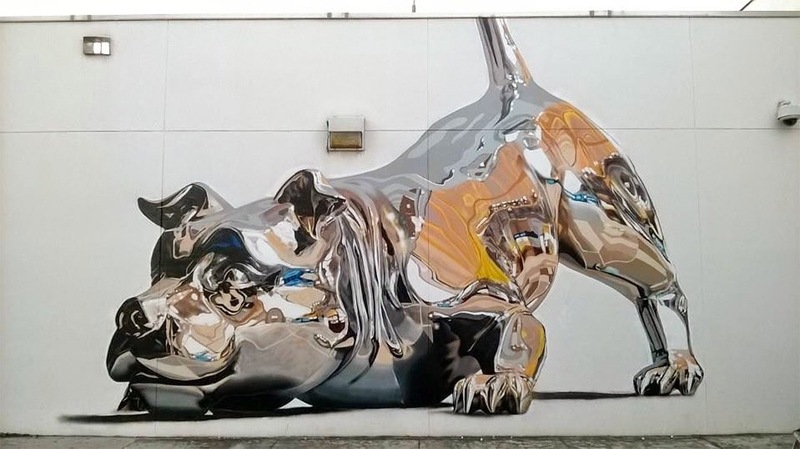 Bik spent about 4 days working on this metallic dog made entirely using spray-paint. Click here to see his striking mural “Handshake”. Manuel Di Rita aka Peeta is a talented Italian graffiti writer, painter and sculptor who currently lives and works in Venice, Italy. He is a member of the EAD crew (Padova, Italy), FX and RWK crews (New York City) and has participated, over the years, in jams, festivals and art shows all around the world. Peeta is known for is incredible 3D art and abstract shapes. Using a variety of shading, gradients and shadows, his work often appears to be hovering just off the surface on which it is painted. Aakash Nihalani is a New York City based artist who uses coloured tape to create his unique art. He is visually creating 3D images on two-dimensional surfaces. “The repetition of isometric squares and rectangles becomes visually pleasing to the eye, conveying complexities such as movement and space by something so simple as the placement of a line. An ex-miner and a well-known Ukrainian artist Sasha Korban created a huge dual mural in Kyiv, Ukraine. Each wall has 50 metres in height (2 walls of 16-floors building). Korban says that his mural conveys the relationship between a man and a woman, their friendship, love and simply the relations between two humans. Korban does not specify the plot deliberately: he doesn’t say what exactly is the couple doing – possibly dancing. “The viewer needs to have the opportunity to see his own script. Maybe to remember something or to dream about something”, adds the artist. Sasha Korban was born on March 12, 1987 in Kirovske of Donetsk Region, Ukraine. In 2006-2011 he worked as a miner at “Komsomolets Donbasu”. He tried street art far back in 2002, but his career as urban artist has started in 2009. His artworks are representing characters and portraits. His pieces are characterized with different techniques and styles like photorealism, pop art, expressive conceptualism, etc. Anna María is a wonderful Puerto Rican artist. Her works depict alien-like creatures that combine human, animal and mechanical forms. Her creations often suggest that humans are at war with everything around them. “I believe Peace is possible, I believe in common sense, I believe in Human Intelligence. Human Being is in constant war with everything; nature, machines, time and himself. “I believe changes comprehend a specie’s environment as much as the specie inside. I want to play with the act of abstinence in my work, creating beasts that can deprive of live at the minimal or inexistent provocation but they choose to stay still, they choose peace. Mark Paul Deren a.k.a. MADSTEEZ is a multi-faceted artist and designer. He is known for his vibrant, large-scale and multi-layered paintings. Madsteez was born blind in his left eye and given three first names (Mark Paul Deren). He grew up on the outskirts of Washington DC where he encountered the graffiti and street art culture. In his paintings, strange and familiar figures are integrated into abstract landscapes. As for his effusive graffiti-style posters of a grinning, bulbous head named Mr. Ween and human-animal hybrids that Mr. Deren calls Ween!mals – they are pasted onto dumpsters, stairwells and billboards in New York, Los Angeles and Seattle. Issa Abou-Issa is a painter, sculptor, and mixed-media artist who works in a variety of styles and mediums. Born and raised in New York City, Issa studied painting, ceramics/Sculpting in New Orleans, New York and California. The artist made the move from the “Big Apple” to the “Big Easy” in 1996 with her husband, which she now calls home. Elian Chali is a muralist from Argentina, Cordoba. Elian is known for his abstract style and unique graphic design. He is using vibrant colors and a rich mix of shapes and patterns.. Elian is committed to recreate the spirit of the neighborhood in his work. Architecture, climate, social policies are only some factors that inspire Elian to create his pieces with the help of geometry and abstraction. The main theme of his works is the city. With more than 10 collective shows and 3 solo exhibitions, his artworks can be found in many countries such as Argentina, Australia, Belgium, Canada, United States, France, England, Italy, Mexico, Poland, Peru, Dominican Republic, Russia and Uruguay. Andrea Michaelsson is a Spanish multi-faceted artist better known by her street artist name Btoy. Her stencils often portray the importance of women, and sometimes incorporate famous portraits. Most of these women are female icons from the 1950’s, often depicted through powerful brush strokes combined with fine stencil lines. Btoy prefers to place street art and posters in old places. These places may include rust on a door and old textured walls.